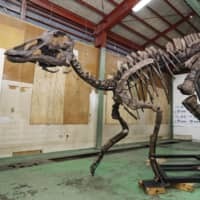 SAPPORO - What is believed to be Japan’s largest fossilized dinosaur skeleton has been restored as a life-size replica, researchers and officials from the town of Mukawa, in Hokkaido, where the original discovery was made, said Wednesday. The replica of the 8-meter-long and 4-meter-tall plant-eating Hadrosaurid, dubbed “Mukawaryu,” was created with duplicates of the actual fossils unearthed from a 72 million-year-old geological layer. 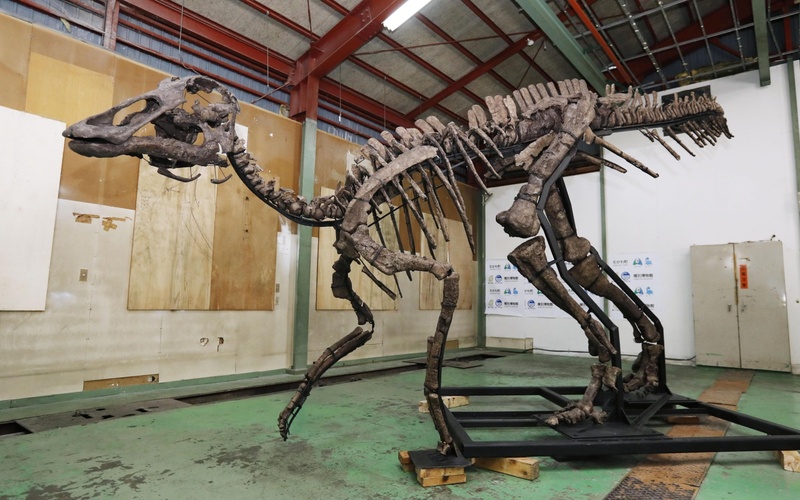 The replica and the fossils will be displayed at the National Museum of Nature and Science in Tokyo for three months from July 13. “A standing Mukawaryu has been resurrected after 72 million years. I hope it will help liven up our town,” Mukawa Mayor Yoshiyuki Takenaka said. The excavation involving Hokkaido University members began in 2013 after local fossil collector Yoshiyuki Horita found a fossilized tail bone in 2003 in the Hobetsu district of Mukawa. More than 1,000 fossil bones were eventually unearthed, making it the largest complete dinosaur skeleton ever found in the country. Complete skeletons are generally defined as containing more than 50 percent of the bones, but for the Mukawaryu, over 80 percent were unearthed as fossils. The work to create the replica of the duck-billed dinosaur began in July 2017 and was completed last month. The replica, unveiled to the media, has a color close to the actual fossils and is positioned as if the reptile is looking into the far distance. “I hope people will immerse themselves in the fascination of ancient history by imagining Mukawaryu strolling over the vast ground of Hobetsu,” said Horita, 69. Hadrosaurids were common herbivore dinosaurs during the late Cretaceous Period and thrived on the Eurasian and North and South American continents in addition to Antarctica, according to Hokkaido University.